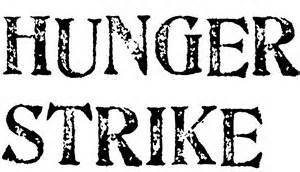 (Sonni’s note: In the past few years entire prisons have gone on hunger strikes, the most notable in California during the summer of 2013. 33 of California’s prisons joined in with thousands of inmates from all over the country in protest of the way they were being treated. Families stood in protest outside the prisons as well. A few inmates died as the result of a hunger strike that lasted 50 days, because they wouldn’t give in. Realizing that the inmates were willing to die for their cause,I am sure, had a lot to do with them relenting. Why was it so impossible for the prison officials to see these people as people – as living breathing people, with some of them there unjustly as the evidence now shows. Eventually they were granted a few small concessions but it was too little and they didn’t apply to the people who were the most confined – those on death row – Those in the SHU Secure Housing Unit. Jamie spent a total of 4 years locked up in solitary. I wasn’t going to print this yet, because I’m waiting for a letter. He was able to get his privileges back and could call me for two weeks. He was able to have ONE contact visit with his natural mother on his 32nd birthday. They found a way to throw him back in solitary last week. I knew it was going to happen. I just knew it. Their rules to stay out of solitary are hard to play by. You can not argue with an officer even if you are right. If they say the snow is black and you say it is white you are insubordinate. He got to make one last phone call, and then was stripped him of all of his privileges and is once again getting his food through a slot in the door. Those on death row. Why would someone scheduled to be murdered by the state be interested in a class of education? I’m sure that’s what the must have thought. Why would any of these concessions be of any importance to them, even though many of them had been locked up for decades and large portion of them were mentally or insane because of the deprivations? But there are many others that want to be able use the rest of their life, if they are still to killed, in a way that at least allows them to give some value to their own lives. Maybe they did something horrible. Maybe they are falsely accused. Maybe they are a victim of circumstance. It doesn’t matter. The are still human. They are living out the worst things anyone can go through to pay for their transgressions – they are waiting to die. That is their sentence. That is their punishment. So why the need to keep punishing by not allowing them some comfort while they wait. Justice was served. What is wrong with supplying them some art supplies so they can draw? They were promised that. This next excerpt is credited to http://www.theguardian.com/commentisfree/cifamerica/2011/jul/25/pelican-bay-prison-hunger-strike where you can read the entire article. Hi Mom, How is everything. I know you are home from your surgery. I hope everything is okay. I have to take a lot of pills. Some are my seizure meds for epilepsy and also fluxotine for depression. I’ve taken off some pounds lately. I stopped eating because I’m on a hunger strike. They feed us pork every day and I’m tired of it. Sometimes they sub it with peanut butter or two slices of cheese. I’ve written lots of letters but nobody writes me back but you. I don’t understand why I keep writing but I do. Maybe I think it will change. I think this is one of the reasons why I get depressed. I can’t make sense of it. People don’t understand how important it is. I still have a year and a half before I come up for parole, in 2014, so there isn’t anything else I can do except sit here. It hurts because we are all suffering badly. There’s nothing I can do about these things. I want to just give up on everything. I’m trying. I really am. Everyone is so quick to judge me. It’s nothing new to me. I can be doing good but I’ll still be judged because of my past. I don’t know where things will end up. Again, I’m losing it. I had some crazy thoughts. The nurse asks me what’s wrong and I just look at them crazy. I know they can’t understand. I guess this is my life. Tomorrow I’m going on strike with my medication. Life is so painful. Why not add more. I have nothing. My fan broke and its August in Texas. It is so hot. And these people took my hot pot that I can cook in because of a loose wire. I can’t take this no more. So what I’m saying is that I’m giving up. Why not? It seems like everyone else has. I read because there’s nothing else I can do, sitting in this cell all day and night. This is where everyone wants me and it’s starting to feel as though this is where I belong. I love you, as well as everybody else, but I can’t take it. Please try to understand. I have fallen and have no reason to get up. I have a year left in ad seg, (solitary confinement – administrative segregation) maybe less. I’m trying, but it seems that nobody cares. Previous Article In Prison, Who Do You Have to Care About Your Day? I have been working on this post all afternoon, so whoever this is, go back and check and make sure you can get into it. I say don’t give up Jamie. Reading is a great thing to do at this moment and if only, if only they would allow you a musical instrument. Sonni, i hope you have been sending him some motivational books too if it’s allowed?? No he isn’t allowed a musical instrument although I think that its allowed in certain states at different levels, but as far a motivational books – you betcha. I’m a Buddhist – 27 years. These last 5 years Jamie he has received a lot of material. Our lives are the result of cause and effect. We get back what we dish out. What goes around comes around, you reap what you sow, however you call it is what determines your life – not an outside source somewhere “UP’ there. Many people disagree but that is only because that is the way they have been raised. On my other blog one of the posts says, I think the title is – “What goes around comes around – every time” I have written about it in several other posts as well. You have to take responsibility for the things in your life that they are happening “TO” you for a reason. Until you learn the underlying cause that it is you – not something happening to you, you will never learn and it will keep happening, We also keep drawing into our lives the same kind of people over and over for the same reason. It’s why we can’t move and make a fresh start and think that it will be different. Your karma falls right behind you and you end up in the same type of circumstances with the same kinds of problems as the ones you tried to get away from. One other thought – nothing happens by accident. Everything happens for a reason. Cause and effect is as real as gravity. So there is a reason I met you and a reason You have met me. There is a reason. Big subject – and now I must go sit and chant – it’s how I pray – but it isn’t to an outside source. I chant nam myoho renge kyo and focus on the things I need to change about myself because I have a whole lot of crap happening “to” me right now and I have to go change that attitude. “You have to take responsibility for the things in your life that they are happening “TO” you for a reason. Until you learn the underlying cause that it is you – not something happening to you, you will never learn and it will keep happening,” You couldn’t have said it better. There is a huge lesson in this quote that would be very helpful to me as well. Thank you. I have spent most of my adult life studying human nature. There is a reason why we are the way we are. Why we react to life the way we do and why it’s so hard to react differently when we want to so much. We realize too late and tell ourselves, “I wish I had not said that, done that, reacted that way etc . So why do we do it. We can’t change ourselves and the way we do things just by thinking about it. We can’t understand it intellectually. Goodness knows, I’ve tried and it doesn’t work. There are things happening in my life I have”allowed” to hurt me over and over, thinking, why are they doing this “to” me. I don’t deserve it. Bottom line – I do deserve it. Somewhere, somehow, I did something along the same lines. This is what it means by ” what goes around comes around”, or Christians saying “you reap what you sow”, or Buddhists say, “the law of cause and effect” It all means the same thing. Also keep in mind that Christians also use this quite heavily when saying God does this, or Good wants that, or God has a plan for my life. This is so engrained in the human psyche and it also allows people an understanding that it is God doing something “to” life and that is all the reason they need because intellectually they can’t understand it is themselves who are doing things in their lives that cause things to happen “to” them. I am not slamming Christians – at least the ones who really do learn from the teachings, many of which come from Buddhism. But many are Christians in name only. Thinking it better to believe just in case there really is a heaven or hell after they die. This is why for 27 years I have practiced Nichiren Buddhism. Not Zen. Not Tibetan. Not Shinto or the other sects, like Christianity has many sects. I want to peel my onion, tear off the layers of my life, the deluded parts of me that keep me being absolutely happy. There are two kind of happiness. Relative – caused by fleeting moments in your life, and absolute happiness that is not shaken by anything that happens to you. Uncovering your true self isn’t easy, but it is what you find in the center of the onion.